Egyptian authorities are investigating possible links between last week's explosions in Sharm al-Sheikh and bomb attacks on the Red Sea coast last year. An Egyptian Islamist group has claimed the latest attacks and named five "martyrs" of "the blessed earthquake". There have also been reports that Egyptian police have linked six missing Pakistanis with the attacks - though the authorities would not confirm this. The confirmed death toll in last week's attacks stands at 64. But hospital officials say the figure could be as high as 88. Most of those who died were Egyptian, although at least eight foreigners were killed. Investigators have said there were two car bombs in Saturday's attack - one outside the Ghazala Gardens hotel and another in the Old Market area. A third bomb, set off in a parking area near the hotel, had been placed inside a suitcase. Investigators have been trying to determine whether the bombers had helped stage the attacks in the nearby Red Sea resort of Taba last October, in which 34 people died. DNA samples are being compared with those of detained suspects to establish any possible connections. An Egyptian group, the Mujahideen, said in an internet statement that it was behind both last week's attacks and those in Taba. The BBC's security correspondent Frank Gardner said there was no way of knowing if the claim was true, but said it claim should be taken seriously, as it spelled out in detail the stages of the attacks, named the individuals involved, and used language similar to that in other claims. The five names given in the statement were Arab names, and included the son of the purported author of the message, "Commander-in-Chief Hammudi al-Masri". The claim came as it was reported that Egyptian police were investigating a possible Pakistani link. Arabic television stations said police distributed photographs of two of six Pakistanis who had disappeared from a hotel in Cairo earlier this month. 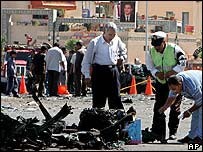 It appears however, that Pakistanis were being sought even before the bomb attacks, and the Egyptian interior ministry has not confirmed that there is a connection between them and the Sharm al-Sheikh bombings. Security sources said police had surrounded two Bedouin villages near Sharm al-Sheikh - Ruweisat and Khurum - where they believed two of the Pakistani men may be hiding. However, BBC correspondent Heba Saleh visited the villages, where residents played down the reports. In Khurum they said there had been no police raids; and in Ruweisat there were some arrests, but there had been no Pakistanis there, villagers said. Correspondents say the involvement of Pakistanis would be unprecedented. Foreign nationals have only rarely been linked to attacks on tourists in Egypt. Pakistan's foreign ministry spokesman said Egypt had not been in touch about any possible link. Pakistani President Pervez Musharraf denied there was an al-Qaeda network in his country capable of orchestrating attacks in Egypt, London or elsewhere. "I am saying very clearly that al-Qaeda does not exist in Pakistan anymore," Mr Musharraf said on Monday. Meanwhile Egyptian officials said they had arrested and were continuing to question large numbers of people. Those killed in the attacks were of various nationalities. There have been reports of Turkish, Czech, Dutch, Russian and Ukrainian victims. One Israeli Arab is also thought to be among the dead. The British Embassy in Cairo said one Briton was known to have died in the bombings. Another 10 still missing are of "particular concern", the British Ambassador Sir Derek Plumbly said.